NOTE: Microchip updates its tools regularly. This page is an older version that we have preserved for the convenience of those who are supporting existing designs based upon older versions of our tools. Please check www.microchip.com/developerhelp for the updated version of this page. Before experimenting with debugging, ensure your system is properly configured by following the steps in the Simple Programming Example tutorial. Once you have confirmed that your system is working, then proceed through the following steps. The same source project is used for all tutorials. 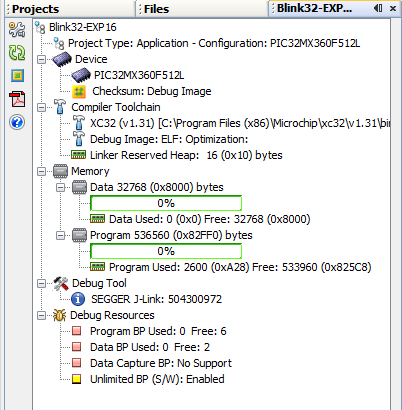 All versions of the J-Link Debug Probe support full programming of the PIC32, but some versions of the probe require additional licensing for debugging. Those devices that do not already include the license (such as the J-Link BASE probe) will temporarily grant you a license. Each time you terminate a session and start a new one, you will have to request the license again. Run and confirm that execution stops at each breakpoint by observing the location of the cursor, and the behavior of the LEDs. Using the SEGGER J-Link as a debugger is that simple. 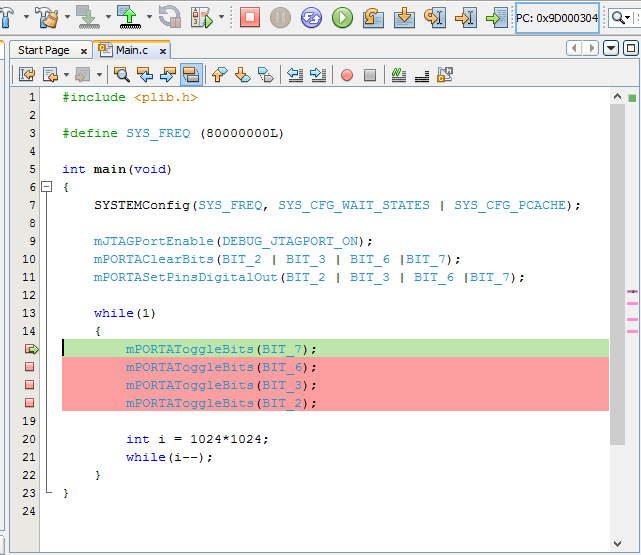 You will notice that if you are using the 4-wire interface that the entire system is noticeably faster than any other programmer/debugger. 2-wire is slower due to the JTAG emulation, so it is recommended that you use 4-wire whenever possible. The only other consideration is that you may need to upgrade your J-Link Debug Probe by acquiring a permanent debugging license through SEGGER's link to *** Additional Software ***.